A recent data sharing endeavor by the Denver Regional Council of Governments (DRCOG) capitalized on the organization's reputation for working together and provided benefits for member governments, partners, community members, and entrepreneurs. DRCOG brings together more than 50 jurisdictions to address challenges that would be difficult or impossible to solve at the local government level. Through collaboration, the organization establishes guidelines, sets policy, and allocates funding in the areas of transportation, growth and development, and aging and disability resources. Known collectively as planimetric data, it consists of building outlines, sidewalks, parking lots, and pavement information drawn through the interpretation of aerial imagery. Planimetric data has historically been cost prohibitive for most of the region's jurisdictions—which include 47 cities and towns—to acquire and maintain, so most planners and GIS staff use outdated information or nothing at all. The data needed to be checked against the imagery from which it had been extracted, so DRCOG's most recent aerial photography was added as an image service layer. Project partners were asked to review the quality, consistency, and accuracy of the data. The 21 partners recorded more than 4,000 edits using the QAQC map. DRCOG then evaluated and curated these edits before sending them to the vendor to be addressed. 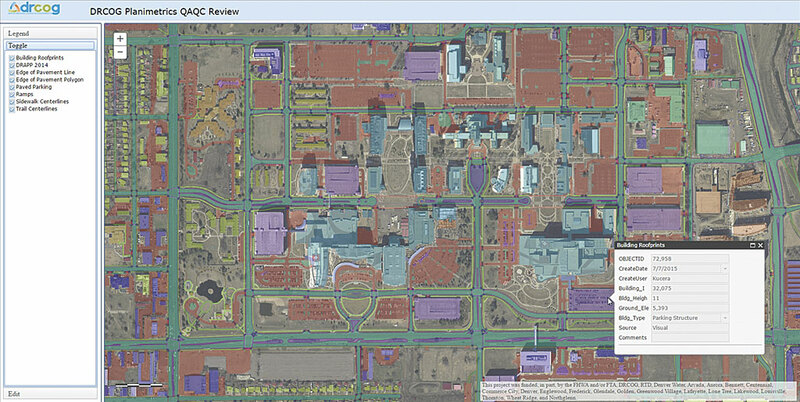 To download the data, visit DRCOG's Regional Data Catalog at gis.drcog.org/datacatalog/. Follow DRCOG on Twitter.